If you’ve ever been involved with the Southern Branch of the Irish PGA, chances are you’ve met, or at least spoken with, Wesley Pappin. Having just turned 90 years of age, the sprightly Pappin shows an appetite and desire to work which bely his years and are testament to the support he receives from the Southern Branch members. “No-one will believe I’m that old, but unfortunately I am. I’ve been a sports fanatic all my life and it’s been a great priviledge and experience for me to be involved with the Southern Branch of the PGA in Ireland over the years. I’d always loved golf and I remember the first golf tournament I ever went to see was the Canada Cup in Portmarnock in 1960 to watch Sam Snead partnering the then newcomer, Arnold Palmer, but Christy O’Connor was my favourite back at that time. I’ve been to watch many more over the years but you never forget your first. As a golfer I was never really great. Originally I was playing in Greystones and living in Templeogue and then I became a member of Foxrock in the 1960’s and I progressed to the position of Captain there in 1977. I was playing golf maybe twice a week back then but I wasn’t very good, at my best I got down to a ten handicap and it didn’t look like I was going to get any lower really! Before I got involved with the Southern Branch myself and my brother ran Motor Radiator business. I knew at the time that it was related to the stress of the business and also knew that if I kept on the business I’d be gone too. I decided to sell it once he had passed on and I wanted to do something else. My only challenge was that I didn’t quite know what I wanted to do and was at a bit of a loose end really. Then someone approached me at Foxrock GC and asked if I’d do some work for General Accident Insurance – as it turned out he was the GM there at the time – and so I took that on, which gave me plenty of time for my hobbies. Just after that, Tony O’Connor who was in Foxrock on the greens staff and on the Southern Branch Committee, asked me if I’d like to come onto the committee and look after the PGA Tankard, which was the biggest event run by the Southern Branch. As a lover of organising things and quite an organised person it was a role which suited me down to the ground. I’d done some organising for the Tennis Club previously so had some idea of what would be involved and I’d moved on then to Table Tennis where I played internationally for Ireland in both a World Championships (Dortmund) and a European Championships (Sarajevo). I managed 20 caps for Ireland all together and when I finished playing I went on to be the non-playing Captain of the Irish team for many years. Anyway, I spoke with the Southern Branch about the role and within a short space of time it wasn’t only the Tankard I was organising, and things just went on from there! Thankfully I wasn’t in it for the money as it wasn’t very well paid but I thoroughly enjoyed the role of Secretary of the Southern Branch and all the organisation and administration that came with it. The Branch must have been happy enough with the arrangement too, seeing as they kept me around for all those years! But it was a bit like being a winning horse, everything gets put onto him! Over the years I was also involved with the Moran Cup and the Southern Branch ran a number of Pro-Ams each year as well as the PGA Tankard. One of the Pro-Ams was one that I’d set up at Foxrock while I was there in 1977 with the pro at the time, Adam Whiston, and amazingly that event is still going to this day, which is fantastic. The PGA Tankard was the main tournament each year and took the bulk of my time. It was, and still is, a vital part of the funding for the Southern Branch, which helps us to fund tall the workings of the Branch as well as the Benevolent Fund which assists PGA professionals who fall on hard times or face illness etc. The Tankard takes a lot of organising, and it was a pretty full time job at times. It runs in approximately 50-60 clubs around the country and it’s open to ladies and gents in the club where one qualifier progresses to a qualifying round which takes place at either Royal Tara or Carlow, depending on your geographical area. From there the first three from each event go forward to the final at Druids Glen, alongside the professional from their home club. I’ve have plenty of memories from all the years but one of the proudest moments of my time with the Southern Branch was when we set-up a Junior Pro-Am in memory of Bobby Brown. I first met him in Foxrock when I joined as he was the assistant to ~Ernie Jones there at the time. 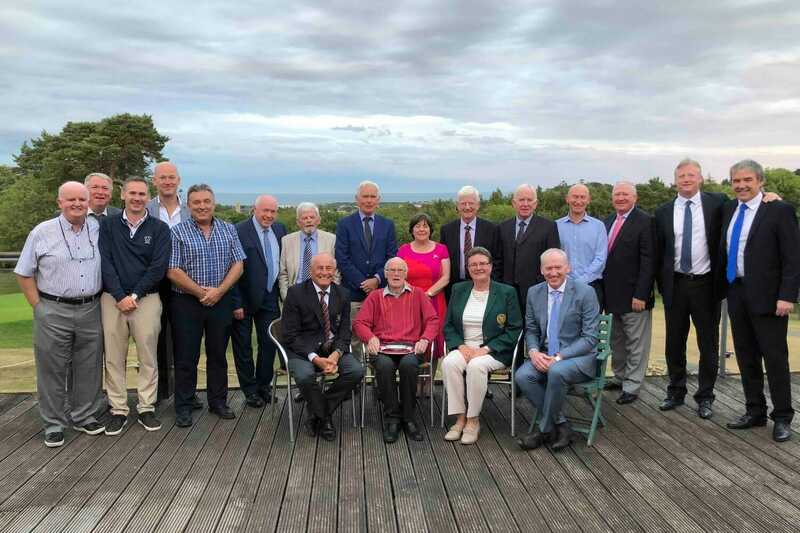 He was a wonderful man, who gave so much to the game and to Irish golf over the years and I am delighted to have been involved in setting up a legacy tournament to remember him. I’ve had to curtail my work with the Branch in more recent times as I haven’t been too well and to my dismay I’ve not played golf at all. I tried to play a couple of weeks ago and I wasn’t bad, I was terrible! It took the enthusiasm right out of me a bit and I haven’t gone back to try again….yet! I come in to help the Branch when they need me now, rather than always being involved in everything as it takes a lot of commitment and time and I haven’t been able to give that of late.